Rawspirations | No Rest For the Wicked – Self Defence at Dark Carnival! 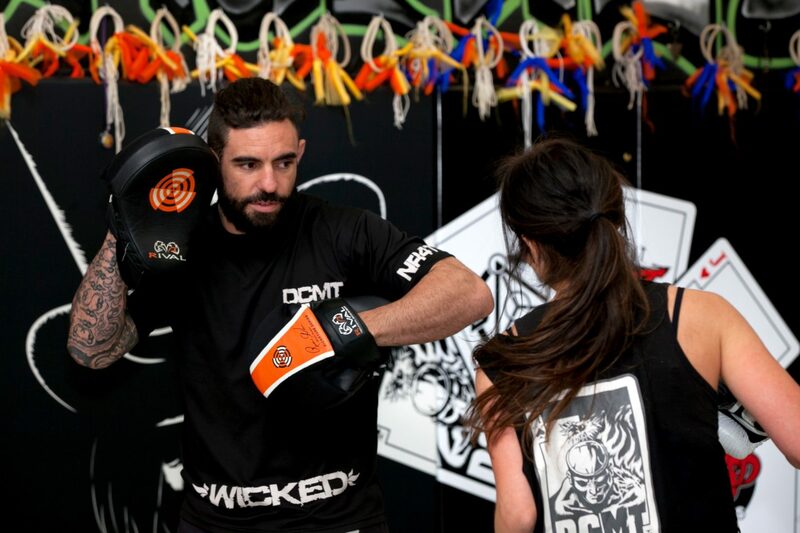 No Rest For the Wicked – Self Defence at Dark Carnival! Today, Sabrina and Rawspirations newest team blogger, Mairi, will share something with you that is not the typical food related post. It’s something that Sabrina is very passionate about and wants to promote amongst everyone, but in particular, women. Imagine yourself being stuck in a situation feeling helpless and not knowing how to get out. Or maybe you found yourself in a situation being approached by a suspicious looking person while going for a run, which has made you rethink ways to avoid it from happening again. Well, its time to take control and empower yourself by getting the freedom back you deserve. About 8 months ago Sabrina had a brain snap and decided that she would pursue a goal she wanted to kick for quite a while. That being, to take up Martial arts and see it through to the end. She asked a good friend who trained in martial arts whom she considered to be the best trainer in Canberra and without hesitation highly recommended Mitch from Dark Carnival. Since training with Mitch the past few months, she can now see why. 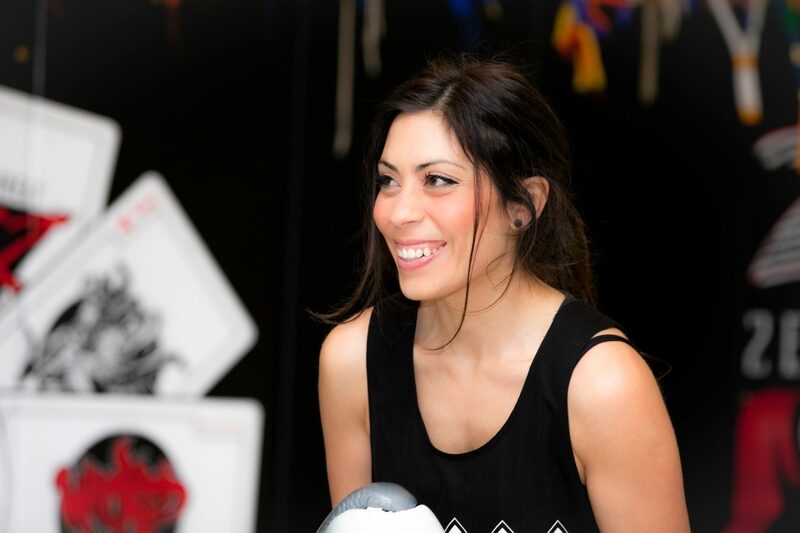 Sabrina believes it’s important for every woman to know self defence skills and wants to break the stigma that surrounds martial arts to show just how amazing it really is. To date she has learnt so much, not only about the different self defence techniques but also about herself. 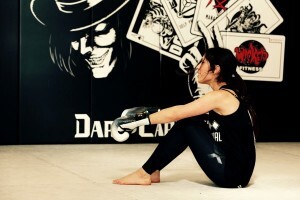 Some of the things you can guarantee to come along with the training are; self preservation, confidence & incredible mental benefits …..
Sabrina absolutely loves training at Dark Carnival and looks forward to each session as it’s always different. We decided to pull Mitch out of the zone so that we could enjoy a relaxed cup of tea and learn more about the story behind Dark Carnival! Tell me a little about yourself and what got you started in Martial Arts? My name is Mitchell Langman and I’ve been training in Muay Thai for 19 years. I started training at the age of 13 and my older brother introduced me to the sport. I always wanted him to take me to his class. But he wouldn’t. Being the little annoying brother, I convinced my mum and she got him to take me to the class. A year and a half later, he stopped, while I kept training which lead me to coach Martial Arts. What does “Dark Carnival” mean and what does it represent? Essentially, there is a massive stigma associated with martial arts being brutal and dark. It is dark what we do, however, it is fun and that’s where the carnival comes in. People are always drawn to the fun and fitness. What people get when they come into Dark Carnival is a completely different experience. They might come in for fun and fitness, but when they leave the class, they leave learning so much about themselves they never knew before. It’s about controlling yourself, mentally and emotionally. Rather than learning how to throw a punch and kick, you learn how to interact with people and develop skills taught on the mat. The bright lights lure people into Dark Carnival and they stay because it’s wicked what we do. Why do you think Self Defence/Martial arts is an important skill for women to know? Usually predators don’t attack someone who’s going to put up a fight. When you look at lions in nature, they don’t attack the head of the herd. They target the old, young, sick, weak and ones trailing at the back that can get easily taken. As we sit in this café and look around, we can see a lady outside adjusting her handbag, looking down and not walking tall and strong. This is an example of how predators view the world. Therefore, women need to appear strong and confident, without being aggressive. When predators see that, they are least likely to attack. The worst thing about this is that a predator is there to be a predator. If not her, then it will be someone else. Until then, women will be seen as vulnerable. To become less of a target you should always be aware of situations surrounding you, appear confident, make eye contact and hold a strong presence. What are the most likely scenarios we’re most likely to see? Most likely scenarios are put down to 2 things, ignorance or bad luck. You don’t want to be looking back on a situation and thinking, how did I miss that? or why couldn’t I see the signs? After 9.00pm till 1.00am, the environment changes. You should stay out of dark places and stick to the light where possible. In situations where you might go for a 5.00am jog, it’s important to be aware of your situation. Don’t put your headphones on so you can’t hear, have at least one headphone out to hear. Be mindful of the environment around you and cut around bushes, incase someone leaps out and surprises you. The ambush situation is a very likely scenario. If there’s someone behind or in front of you, make sure they are aware you can see them. They could also be going for a walk, however it’s the importance of being aware of what’s around you. The most likely scenarios are wide areas, car parks where there isn’t many cars and your at a pay machine, park lands, bike paths, going for a run, even basic as going to and from your car morning and late afternoon. Can you tell me any good news stories that have come out of someone been trained in this art? There’s been a couple of good news stories. Recently a lady was going for a jog and a guy jumped out and threw her to the ground. She knew Jiu jitsu and defended herself by a choke hold then broke his arm. One other story was a girl from the UK got attacked in the back alley while walking home. Unknown to the attackers, she used her kick boxing skills as self defence. She ended up coming out with a black eye and few bruises, however escaped from the predator. Another story from the UK- A lady was at home, while getting out of the shower, she noticed men had broken into her house. 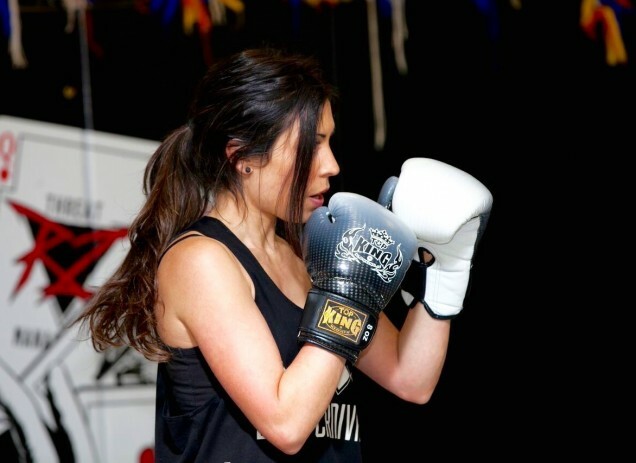 She knew kickboxing and was able to fight one attacker and ran from the dangerous situation. Sabrina is progressing really really well, and I’m not saying that because she’s sitting across the table from me! When Sabrina first started she was already aware about her surroundings and reading situations. However, posture and body language was the look of a victim. This has changed through training, she now stands tall and strong. When we first started on the mats, the closest she would stand was 2 meters from me. When I moved forward, she would move back. That was her personal space and bubble. Now she’s getting more comfortable and confident at getting close. Another improvement is her confidence to question the process in what we’re doing and asking ‘what if’? which is awesome. We’re building up to a point where I’ll increase the pressure more and more. This is where the physical and mental training starts to come through. She’s coping really well. It’s great. What would be a good must do course to start with that covers all the basics in self defence and then where to from there? At Dark Carnival we run self-preservation classes every Tuesday and Thursday. Later in the year (2015) we’ll be starting a 12-week women self-defence course teaching the fundamentals of self-perseveration. We teach a common sense approach to Muay Thai and a common sense approach to Jiu Jitsu. In a dangerous scenario you want to do what you can to get out of there. In the worst-case, if someone holds you with a weapon and asks for your wallet, hand it over. Whatever is in your wallet can be replaced. Dark Carnival rocks! *laughs*. On a serious note, I want to draw on the importance of Martial arts training and exactly what you get out of it. Fun, fitness, body conditioning and body identification. It’s a great work out and you push personal boundaries that start to build the psychological and mental aspect. If you got attacked outside, you’re not going to hold back, you’re going to do exactly as much as you need to survive and get out. 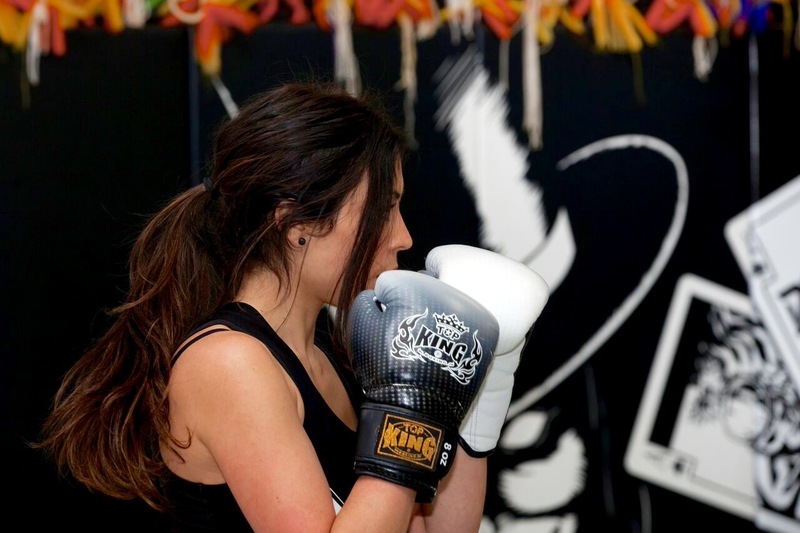 We teach you to exceed your expectations so you can get better, while at the same time improving mental, physical and emotional benefits from Martial Arts.